The concept was unveiled on Monday ahead of this week's Shanghai auto show. The car is 4300mm (169.2 inches) long, similar in length to the automaker's A3 compact, but has the cabin space closer to that of a midsize car because of its short overhangs and lack of a propeller shaft tunnel in the interior. The concept's interior is designed to be comfortable while the car's occupants are being driven around a city in autonomous mode. It has Level 4 or "hand free" autonomous capability, which means it can drive itself in most situations, but the driver can take back control. The large side doors open in opposite directions to facilitate getting in and out. The concept anticipates a future where parts of cities are geofenced using global positioning system or radio frequency identification to allow cars to drive autonomously. Outside the area, software would automatically turned off the self-driving mode. Outside the geofenced area, the driver would steer the car. The steering wheel retracts for piloted driving behind a cover made of walnut, which can also then be used as a table for working or eating on. The car also includes a magnetic table in the center console for holding metal-bottomed plates or cups. The interior of the car uses a mix of recycled materials, wood and more technical fabrics. Wooden struts along the roof along climbing plants to grow, bringing an element of nature into the car. Plants and their air-cleaning properties are particularly valued in China, where the air quality is often poor. Despite its tall, compact design, the AI:ME demonstrated that a roomy, compact car does not have to look dull, Audi said. 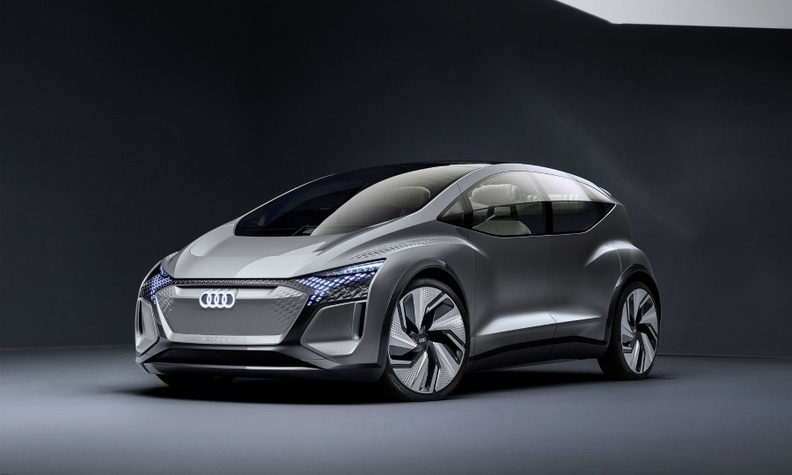 Audi didn't specify what platform the AI:ME uses but any future compact electric model launched by the brand would use the Volkswagen Group's MEB electric architecture platform. Audi unveiled the Q4 e-tron concept reviewing a future compact SUV using the MEB platform at the Geneva auto show in March. Media commentators compared the AI:ME with Audi's A2 small car, which was hailed as revolutionary for trying to reinvent the small minivan but was axed in 2005 after slow sales. The AI:ME's design was created with visual links to Audi's 2017 AIcon concept, which showed ideas for a luxury autonomous sedan. Audi said similar design elements included the long arch of the roof and side windows which changed angle as they neared the roof. Elements such as the large, 23-inch wheels and accentuated wheel arches further increased the dynamic look, Audi said. The AI letters in both cars' names stand for artificial intelligence. The AI:ME car is not engineered for performance but instead operate efficiently between 20 kph and 70 kph (12 mph and 43mph). A 65 kilowatt-hour battery feeds an electric motor that makes 168hp. The AI:ME is the third of Audi's recent forward-looking electric 'vision' concepts after the AIcon and the PB18 sports car concept shown last year. It promised a fourth concept in the same series at the Frankfurt auto show in September, without going into more detail.